Proprietory Mix (Soybeans, Grape, Banana, Pineapple, Asparagus, Barley, Broccoli, Cabbage, Cantaloupe, Carrot, Citrus Peel, Honeydew, Peas, Pear, Peach, Grapefruit, Lemon) Fructose, Strawberry, Rice Powder, Vanilla. WOW! no wonder it costs a bomb! Nutrition is one thing, but the drink actually tastes fantastic Believe me it’s far from the coppee tiam fruit juice which has 2 drops of freshly squeezed juice mixed with two cups of water and 3 table spoons or sugar. 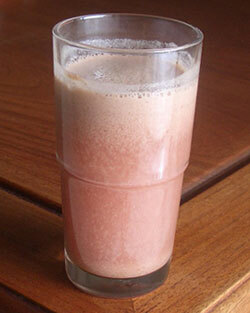 These so-called fruit juices really cheese me off but Nutrifresh is for real. EExcel is good but very expensive. I totally agree with all the benefits listed for E-Excel product, especially Nutrifresh. Due to the weather, I used to fall sick as often as every month. I am also afraid of staying with people who are sick, because I will easily get infected after the close contact. However, my classmate never afraid of sitting beside me in class even I am sick, and Nutrifresh is her secret to her healthy body. Hence, my mother bought it for me to have a try. Indeed, my health improved a lot since then. 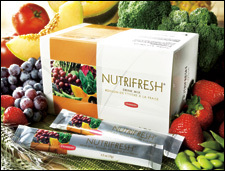 I can feel that my immune system has already boosted up after taking Nutrifresh. Although it really costs a bomb, but to me, it is worth, as it allows me to cut down my medical cost! Plus I have a healthier body now. Thanks to E-Excel, the excellent product that helps many people to gain back health. can i have the address in Malaysia Kuala Lumpur? i want to buy. You can also buy through any E Excel agent. Or join their MLM program and save on commission if you take it often. If you are interested in buying any eexcel products, you can email me and we can arrange to meet up. I live in Toronto, Canada. Do you know where I can buy excel products. I am using Nutrifresh now and I am very happy with it. I can post to you. Do get me at 0123180373 for any products. Hi, anybody interested in E.Excel product can email me at yescomer@gmail.com. Expertise in Worldwide shipping. Good Promotion this month September for new joining member E.Excel. Membership RM80+ plus FREE product value of RM110. Interest person can email yescomer@gmail.com. Member can get discount of 5% for all product purchase. MU FRIEND BOUGHT ME THE NUTRIFRESH DURING THE CANCR TREATMENT. NOW FINISH ALL THE TREATMENT , BUT THE NUTRIFERSH HAD EXPRIRED.. SO CAN I STILL CONTINUE WITH IT ?ANY HARM? May I know where can buy at kl area or selangor area?